In a world where everyone is way too exposed owing to the Internet, it becomes very easy to get your hands on the personal details. Isn’t that risky? Solving cases now has become a bit easier because cracking clues from social media is feasible. But what about the strategies that were employed when the Internet wasn’t there? 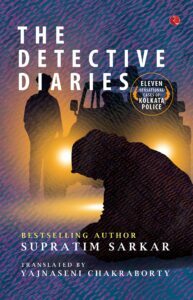 ‘The Detective Diaries’ is an answer to this question because it narrates eleven stories (read episodes) from the archives of Kolkata Police. Supratim Sarkar has done a wonderful job of weaving the narrative and executing the plot by serving the right amount of suspense and struggle. A wide variety of cases like that of extortion, murder for money, serial killings and homicide- this book is a recommended read for all the mystery lovers who are fascinated by the idea of reading between the lines and possess the alacrity to note every single minute detail. Not only for the sake of entertainment, but these cases also raise awareness for the crimes that take place in broad daylight. Using the third person narrative, the author uses lucid language but strong and effective expressions that make the readers believe that the entire scene is taking place before their eyes. However, it becomes quite evident that not all details were made a part of the plot. Somewhere, this might leave the readers wanting for more. Nevertheless, the cases also throw light on the grit and determination that goes into the entire process of keeping the citizens safe and fighting the crime.